El Hierro, nicknamed Isla del Meridiano (the "Meridian Island"), is the smallest and furthest south and west of the Canary Islands. Like the rest of the chain, the island is sharply mountainous. It has an area of 278 km². The highest point is situated in the middle of the island, in Malpaso, 1501 meters high. Like all the Canary Islands, El Hierro is a tourist destination. It is served by a small airport at Valverde and a ferry terminal, both of which connect to Tenerife. It seems that the flag of El Hierro is based on a symbol in the shape of a flag that was used in the Bajada de la Virgen de los Reyes (Descent of Our Lady of the Kings, patron saint of the island), the island’s main celebration, in 1953. 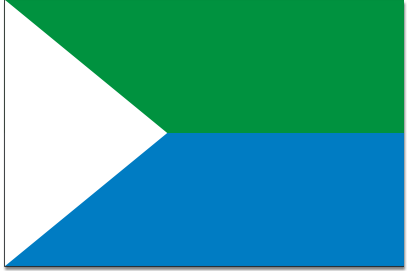 The triangle represents esquematically the shape of the island; the white symbolizes the clouds, the foam of the sea, the penant that every four years crowns the Bajada and the mist that distils water from the Garoé tree (sacred for the aboriginals); the green stands for the mountains, the vineyards, the fruit trees and the Garoé tree; the blue is for the sea horizon. Order of 18 Jul 1987 (BOC of 29 May). 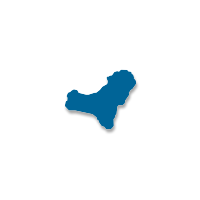 There is no record of the official approval of the coat-of-arms of El Hierro. Azure, a tree vert, on a terrasse of the same, crowned by clouds silver, issuing from a pool of the same. Between a castle gold to the dexter and a lion gules to the sinister. Crowned with a count's crown. The tree is the Garoé or Holly Tree, that condensed in its branches the mist and distilled it as rain, thus supplying water to the first inhabitants of the area. 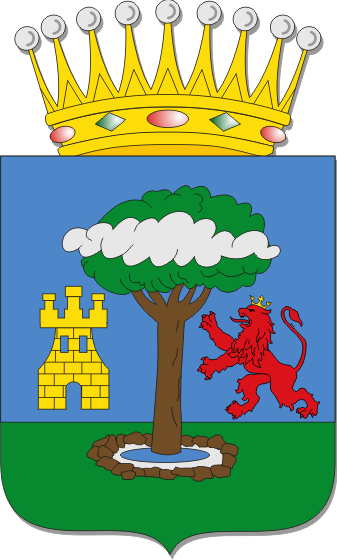 The castle and the lion symbolize the island's bindings with the Crown of Castile, while count's crown alludes to the Counts of La Gomera, who were as well lords of El Hierro.